Beautiful work Creekside! Love the grain patterns in the boards. Maybe they lost their "9" somewhere in the shop and used a "b" upside down. Then later found the "9" die again. LOL Is that a sideways T in front of the weight number? If so, my roughly thrown together records show your anvil may have been made by a fellow named "Doggie" Taylor. Wouldn't that be an ABT? You guys are making me hungry. But in my world, an ABT is an Atomic Buffalo xxxx - half a jalapeno filled with a cream cheese mixture, topped with a big piece of pulled pork, wrapped in bacon and BBQed/grilled until the bacon is crispy. I can see that, but fuzziness and made of metal? How do you resolve that without ending up with spikey, pokey? I was just focused on the eyes and that black line that looks like a mouth. So much expression there. Now if you could find some of those twisted wire, plastic bristle brushes - kind of like a narrow bottle brush or the little brush on the spark plug gapping tool for the legs. Das, if you mentally remove the hair from that jumping spider and just look at the position of the legs and get the eyes right (maybe the back of a small spoon for the face to mount the eyes) you'll get the essence of it. If that were my set up, I'd get the next size smaller crucible (need more room for the flame to circulate around the crucible), a smaller diameter, but taller plinth (about 1"-1 & 1/2" tall) and aim the burner flame to go around the crucible, not pointed at the crucible. But first I'd take the burner out and clamp it in a vise, light it and make adjustments til I had the beautiful blue flame cone Mikey likes so much. What I've gained from taking up blacksmithing is more TOOLS! I LOVE tools. And I've also gained a revelation (at least to me) - making tools. The thought had never occurred to me before. But I couldn't afford some of the cool tools associated with blacksmithing. I love tools - I love making stuff - so I looked into making them. Then I made a forge... then a forge press... then a belt grinder... then a burnout/heat treating oven, then two salt pots, then another metal melting/burnout oven... then a vacuum casting set up. Friends were sure I'd never get back to blacksmithing/bladesmithing, or anything else...just get carried away making tools. But what's wrong with that?! I was having fun and learning a lot. And I'm working on getting back to blacksmithing/bladesmithing. Anyone know of any rehab programs for tool making addiction? Never mind, I don't need a cure. I'm fine. I can stop any time I want to. Really! Like Dan said, If that ceiling layer of insulation is thicker now than the original was, you need to move your burners down into it more. Probably depends a lot on the type of press. For the 24 ton forge press I built, I used a Prince LS-3000-1 Directional Control Valve. There are a LOT of variables in a LOT of different processes to get from start to finish in what you're doing. I'm in a similar process casting brass knife hardware. Hard to keep track of it all. Hard to change just one thing at a time when the process can take so long for each little test of a change. I'm using an SLA/DLP resin printer and was told, with the resin and investment I'm using, I could put the flask in and take it straight to 800C and shorten the 15 hour burnout schedule considerably. Like down to 3 1/2 hours. I could even preheat to 600C, then put the flask in the oven and take it to 800C. Well, heating the flask from ambient temp to 800C as fast as possible worked, but the surface finish of the cast brass suffered, in my opinion, greatly. Adding the flask at 600C preheat and taking it to 800C, the investment shattered. Now I'm back to the ramping up in three steps to get to 800C and running the 15 hour schedule. But you've got to experiment or what do you know. I turn on the vacuum just before pouring. In my experience, the metal (brass in my case) goes in and starts to solidify so fast, if I turn the vacuum on after pouring, it has no effect. Before pouring, it helps pull the metal in. That's what I said. But perhaps this part "But I'd guess that it's close." wasn't clear. I meant "I think I'm pulling close to a full vacuum", not "I think my gauge is reading accurately". Obviously my gauge is WAY off. Recipe...let's see, set the "oven" at 2100F, put the cake pan in, set the timer for, oh, say 3 seconds...Ding, it's done! Oh dang it, I used an aluminum pan. Now I have aluminum swirl cake. 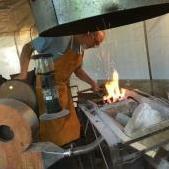 Back to forging - I like the flexibility in the design of your forge. If you're doing something large, you can raise the top "clam shell" with firebricks to get larger interior space.